We, the Steering Committee, by mutual consent, hereby form Holy Family Homeschoolers as an unincorporated association under Wisconsin Statute 184.02. Executed this 15th day of January, 2003. Amended this 22nd day of October, 2003. A homeschooler shall in this Charter designate a family that has filed Form PI-1206 with the State of Wisconsin for at least one school-age child, as well as those who plan to file PI-1206 once their children reach school age. The name of this unincorporated association shall be Holy Family Homeschoolers. The association shall have such principal office as may be determined by the Steering Committee. The principal office is currently the home address of the Secretary. The affairs of the association shall be managed by the Steering Committee. The Steering Committee shall have supervision, control, and direction of the affairs of the association, shall determine its policies or changes therein within the limits of this Charter, shall actively prosecute its purposes, and shall have discretion in the disbursement of its funds. It may adopt such rules and regulations for the conduct of its business as shall be deemed advisable, and may, in the execution of the powers granted, appoint such agents as it may consider necessary. The number of Steering Committee Officers shall initially be six, and in the future, shall consist of not less than three nor more than seven as determined by the Steering Committee. 3. Meetings of Steering Committee Officers Meetings of the Steering Committee Officers shall be held upon the call of the President or shall be called upon written request submitted to the President by not less than two Steering Committee Officers. b. Notice of Meetings. Notice of any meeting of the Steering Committee shall be given at least 5 days but not more than 50 days previous thereto by written notice delivered personally or sent by mail or email to each Steering Committee Officer at the Officer's last known address as shown on the association's records. c. Quorum. A majority of the number of Steering Committee Officers then in office shall constitute a quorum. The act of the majority of the Officers present at a meeting at which a quorum is present shall be the act of the Steering Committee. d. Voting. Each Steering Committee Officer then in office shall be entitled to one vote upon each matter submitted to a vote at a meeting of the Steering Committee Officers. e. Informal Action. Any action to be taken at a meeting may be taken without a meeting if a consent in writing setting forth the action so taken shall be signed by all of the Steering Committee Officers entitled to vote with respect to the subject matter thereof. Such consent shall have the same force and effect as a majority vote at a meeting duly called and held. 4. Committees A committee of Holy Family Homeschoolers may be established by the Steering Committee. The President shall appoint a Chair of the committee with the approval of the Steering Committee. The Chair shall appoint committee members with the approval of the Steering Committee. The committee Chair shall serve until the committee has completed its work or until such time as the member is removed by action of the Steering Committee, resignation, disability, or death, at which point the Steering Committee shall appoint another committee Chair. been an HFH member for a minimum of twelve months. Formal offices shall include a President, Vice President, Secretary, and Treasurer. The Steering Committee may elect or appoint such other Officers as it shall deem desirable, and such Officers shall have the authority to perform the duties prescribed from time to time by the Steering Committee. All Officers shall be elected by the Steering Committee. a. President. The President shall be the principal executive Officer of the organization. The President shall perform such duties as are normally incident to the office of President. The President shall preside at all meetings, develop the agenda, appoint committees, and assign additional duties to Members. The President shall be the official representative and spokesperson of Holy Family Homeschoolers. The President may designate an alternate to perform any of these functions. b. Vice President. In the absence of the President, in the event of his/her removal from office or his/her inability to act, the Vice President shall perform the duties of the President. The Vice President shall perform duties as may from time to time be assigned by the President. c. Secretary. The Secretary shall schedule the taking of the minutes for all organization meetings. Minutes shall consist of a brief synopsis of what was said, all motions, and the recorded vote on the motion. The Secretary shall perform all other duties incident to the office of Secretary and such duties as may be assigned from time to time by the President. d. Treasurer. The Treasurer shall perform all duties incident to the office of the Treasurer and such other duties as may be assigned from time to time by the President. 2. Term of Office All offices shall be held for a period of one year, renewable June 1, or until their successors shall be elected by the Steering Committee. Officers may serve an unlimited number of terms. The term of office shall continue until such time as the Steering Committee Officer is removed by action of the Steering Committee, resignation, disability, or death. Any vacancy occurring in the Steering Committee may be filled by the majority vote of the Steering Committee Officers then in office. 3. Nomination of Steering Committee Officers Nominations will be accepted once per year at times when there is a vacancy to be filled. Any Member may nominate any other Member (including himself or herself) to serve on the Steering Committee. 4. Removal of Steering Committee Officers A Steering Committee Officer may be removed from office with or without cause at any time upon a majority vote of all of the Steering Committee Officers then in office. The remaining Steering Committee Officers may select a successor to any Steering Committee Officer who has been removed from office. 1. Files PI-1206 for at least one school-aged child or plans to file PI-1206 for at least one school aged child or who qualifies as either an Alumnus Family or Core Family member as defined in the membership registration and renewal documents. 3. Has submitted a properly-completed membership form. 4. Respects the mission statement of the group and abides by group policies. A family designation of "Catholic," for our records, is determined by how the children are being raised, as indicated by the parents. 2. Membership Term. Membership is renewable each year. 3. Parents Circle. The Parents Circle is comprised of Holy Family Homeschoolers Members who attend any given Parents Circle meeting or who direct another Holy Family Homeschoolers Member to represent him or her. Parents Circle Members weigh in on group activities and offerings and perform other tasks and responsibilities as assigned by the Steering Committee. a. Meetings.The President shall preside at Parents Circle meetings. Any Member may request that a matter be added to the Parents Circle agenda, but the Steering Committee may exercise discretion on whether to include a matter on the agenda. b. Recommendations: Recommendations of Parents Circle members will be considered by Steering Committee members for possible future implementation. 4. Removal from Membership. 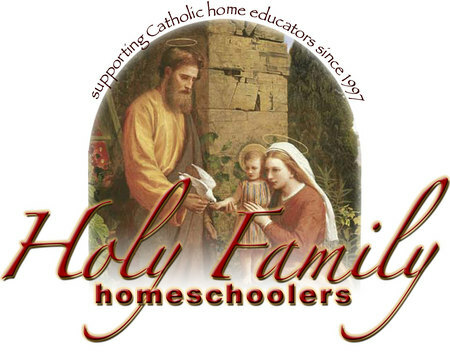 Any Member can be removed from Holy Family Homeschoolers by the vote of a majority of the Steering Committee under the guidance of the Spiritual Director. Members who fail to respect our Catholic homeschooling mission will be asked to leave HFH. The Spiritual Director advises the Steering Committee, serves as arbiter, and provides spiritual direction to Holy Family Homeschoolers and its Members. Any Steering Committee Officer may request arbitration on any Steering Committee matter from the Spiritual Director. Any Holy Family Homeschoolers Member may request arbitration from the Spiritual Director after the Steering Committee has been given notice of the grievance in writing and has met with the aggrieved party. The Steering Committee agrees to be bound by the decision of the Spiritual Director unless a majority of Steering Committee Officers deem the decision to be gravely detrimental to the mission of the group. HFH will not knowingly associate with any priest or parish that is not faithful to the Magisterium of the Church or fails to guard the Deposit of Faith. The association shall use its funds only to accomplish the objectives and purposes specified in this Charter. On dissolution of the association, the Steering Committee shall, after paying or making provisions for the payment of all the liabilities of the association, dispose of all the assets of the association exclusively for the purposes of the association in such manner or to such organization or organizations organized and operated exclusively for charitable, educational, religious or scientific purposes as shall at the time qualify as an exempt organization or organizations under Â§501(c)(3) of the Internal Revenue Code of 1986 (or the corresponding provision of any future United States Internal Revenue law) or to any political subdivision or subdivisions of the State of Wisconsin, as the Steering Committee shall determine. This Charter is hereby adopted by the association as of the date on which all serving on the Steering Committee have signed this Charter.